Classes and programs offered within the FCS program in New Hanover, Brunswick, and Pender Counties focus on the components of the food system. Understanding how the food system works and how we play a part will help us make the best choices when buying, eating, and recycling food! 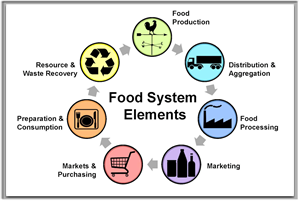 You can see the food system map below and consider how your food flows through the elements and what influences (social, environmental, political, contextual) effect or change the way you eat! Browse through the links listed under the Available Programs tab to learn about what we have to offer related to food and nutrition! If you see something you are interested in, we would love to have you join one of our classes or programs! To sign up for notifications for any of our future class offerings, fill out the form here: http://go.ncsu.edu/fcsinterest. For questions about any of the FCS programs, contact Morgan McKnight, morgan_mcknight@ncsu.edu.